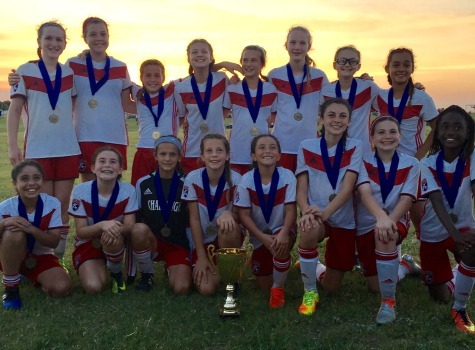 This past weekend Challenge 05 Clear Lake made an important step in the team's transitioning to the 11-a-side format by winning the Under-12 bracket in the 21st Texas Lightning Youth Cup, competing against formidable North Texas teams. Playing the first game under the flood lights at the Harold Patterson Soccer Complex against Sparta FC, Challenge 05 Clear Lake got off to the best possible start, playing attractive free-flowing attacking soccer, with a 2-0 win, with goals from Aaliyah Ramadan and Sydney Bassa and both goalkeepers Audrey Wilson and Anne Marie Cabello recording shutouts and Carlie Edmonds and Abigail Scott dominating in defense. Overall, it was an excellent team performance and quality soccer was played all over the pitch, with Celeste Gonzales forcing several excellent saves from the Sparta goalkeeper. Very impressive performances came from Mia Brumlow and Kennedy Tristan, who were at the heart of all the action; their work ethic and creativity was excellent throughout the game. Best wishes for a speedy recovery to team captain Brooklyn Guajardo, who sustained a fractured growth plate injury prior to the first game. Early morning Saturday games saw Challenge recover from an early setback in adverse, windy conditions with a 9-1 win against SA Extreme FC, with hat-tricks from both Sydney Bassa and Aaliyah Ramadan, two goals from Kaia Butler and one from Elena Siekas a great strike from just inside the penalty area and still rising as it it the back of the net. The back four playing calmly building the attack from the defensive third. Outside midfielders Mackenzie Prigmore and Kaia Butler ran their opponents ragged and contributed quality service for their teammates to finish. Avery Foster played great defense to neutralize a strong fast forward almost twice her size, to prove once again the old adage "it is not the size of the dog in the fight, but the size of the fight in the dog." Kudos to Caitlin Roach playing in an unfamiliar role of outside left-mid and working tirelessly from box to box to support her teammates, showing a great attitude putting team first. The third qualifying game against Arlington Premier League Fall Champions San Angelo 05 Blue saw a well-contested game which ended in a 1-1 tie, Challenge 05 Clear Lake recovering from an early setback to control most of the game and playing quality soccer against good opposition. A surging forward run from right fullback Leslie Robles and perfect driven cross to the back post where Kaia Butler calmly finished and leveled the score. Audrey Chalaice proved to be a calm influence in the midfield and providing the spark to ignite the counter attack after breaking down the opponents possession. Numerous attempts to secure a deserved victory were unsuccessful and the 1-1 tie was enough to secure number one seeding into the championship game. The fourth and championship game in twenty-four hours saw Challenge 05 Clear Lake play Lake Highlands Girls Classic League opponents FC Dallas Youth 05 East. An excellent solo goal from Kaia Butler saw her glide past several defenders and fire a rocket of a shot into the goal at the far post. The girls overcame the physical elements of the game to play attractive and thoughtful soccer in the first half. After a dubious penalty was awarded to the opponents near the end of the first half, the team rallied and continued to press the opponents until half time. Audrey Wilson was outstanding as an option for her defenders to break pressure and pass back for her to clear any danger, several times driving the ball clear over the half way line to save the day. After half time the girls returned focused and motivated; each and every one of the girls found the energy and determination to finish the game and tournament in style. With quick ball movement crunching tackles, the team dominated the second half not allowing FC Dallas girls to get a foothold in the game. Pressing forward relentlessly, the breakthrough came after an excellent flowing counterattacking move involving five Challenge players and after a great cross into the penalty area from Aaliyah Ramadan, there was Mia Brumlow driving a left footed rocket into the roof of the net, an excellent finish for a tremendous team goal. Continuing to press forward for the next goal, Aaliyah Ramadan picked up the ball near the half way line and beat the first defender and then the next, and as she entered the box, she had the audacity to nutmeg the final defender before rifling the ball into the far upper-90 for one of the best goals seen by all present for a long time--a truly remarkable individual goal, resulting in at least half of FC Dallas parents standing up and folding their chairs as the game as a contest was well and truly over. For the final five minutes the game was played in a calm yet purposeful manner with Challenge 05 Clear Lake still passing and probing for an opening for the next goal. Surging runs from left fullback Avery Foster typified the attitude and work ethic in all the players. After the final whistle, the irony of this championship final in today's social media driven world is that not one parent had a camera or iPhone recording three breathtaking goals and an first class second half team performance. Overall, after four games against good to quality North Texas teams the tournament statistics will show a record of three wins, one tie and no loses, goals for 15, goals against 3; however, the stats will never show the manner which Challenge 05 Clear Lake dominated and outclassed all opponents and the sense of pride and achievement the players, parents and coaches felt for a job well done.